Well, it’s official: February 27th is Coco Day in Los Angeles. 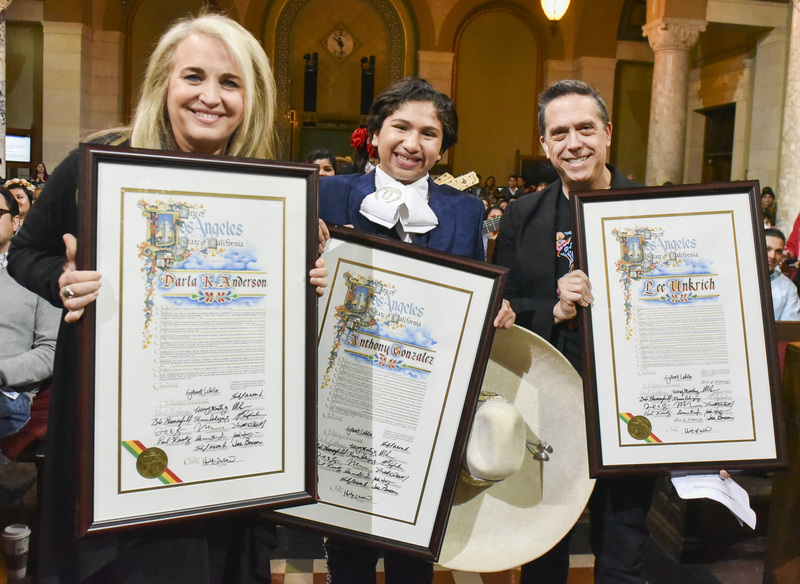 Yesterday the City of Angels honored Pixar’s 19th film at a ceremony in City Hall by L.A. City Council Member Gil Cedillo. The honor was not only inspired by the most recent DVD/Blu-Ray release of the film, but the fact that Coco is the first animated film to feature nearly an entire Latino cast. Most of the ensemble has roots in Los Angeles, which made the ceremony very special for some. The honors were respectfully given to Lee Unkrich and Darla K. Anderson, the Director and Producer of Coco, and these members of the cast were also there to celebrate the success of the film and show their support to the local Latino community: Anthony Gonzalez (Miguel), Renee Victor (Abuelita), Gabriel Iglesias (Clerk), Alfonso Arau (Papa Julio), Selene Luna (Tia Rosita), Lombardo Boyar (Mariachi/Gustavo), Blanca Araceli (Emcee), Dyana Ortelli (Tia Victoria) and Carlos Moreno Jr.
Coco is the first Pixar film to be given a day of celebration and it’s so obvious why – between the depiction of the Latino culture and Day of the Dead, on top of the heartfelt story tackling death and fulfilling your dreams, it’s no wonder that Coco soared it’s way into the hearts of millions. We don’t think anyone’s going to forget about this film anytime soon, and we can only hope it opens up more films that have Latino leads and other stories that focus on underrepresented characters in animation. Stay-tuned for the Oscar’s this Sunday to see if Coco takes home the gold for Best Animated Feature Film and Best Original Song.